We are bombarded by the importance of attracting patients and retaining patients and both are important, but there is a step you could be leaving out. You could be leaving out the step that actually has one of the biggest impacts on your patient retention. If you attract patients to your practice but don’t convert these patients to appointments, then it means you really have less patients than you should, to then try and retain. This equation does not add up!!! Converting means: a person who adopts a new belief, or a changing action. Converting happens on the first phone call to the practice and then again in the treatment room when the patient is making decisions about treatment and care. If your phone is not ringing, then not many appointments can be made, so you can see how important attracting patients to your practice is. Now imagine if your phone is ringing and appointments are not being made. Does this sound like something that is happening at your dental practice? Does your phone ring but calls are just not being converted to appointments? Maybe the phone is ringing, the calls are being converted to appointments, but the appointments are then being cancelled as quick as they are made. No appointments equal less patients to retain. Can you now see how crazy it is if you focus only on patient attraction and retention! Leaving out converting patients will gradually create a very big problem. I have worked alongside Dentists who are concerned about the number of New Patients making appointments. On closer observation we start to see that the problem is the call conversions. We then look further at how the calls are being handled, how objections are handled and what is stopping the front office from making that appointment for the caller. The first step is seeing you have a problem with call conversions then diagnosing the real issues and where the problem lies then implementing strategies to fix the problem. The solution is to show your team how to properly convert calls to appointments by finding someone who knows how to do this. So keep an eye on your patient numbers. As soon as you believe that something is just not adding up or making sense get help and fix it rather than ignoring it and hope it gets better by doing nothing! You could be too focused on attracting New Patients and retaining your patients and missing out on converting the calls to your dental practice into New Patients. 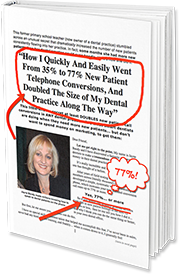 If you’d like to know more, download my FREE special report “How I Quickly and Easily Went From 35% to 77% New Patient Telephone Conversions, and Doubled The Size of my Dental Practice Along the Way” and discover some of the many costly mistakes being made on your phone…..